The image above from the NASA/ESA Hubble Space Telescope shows the rich galaxy cluster Abell 3827. 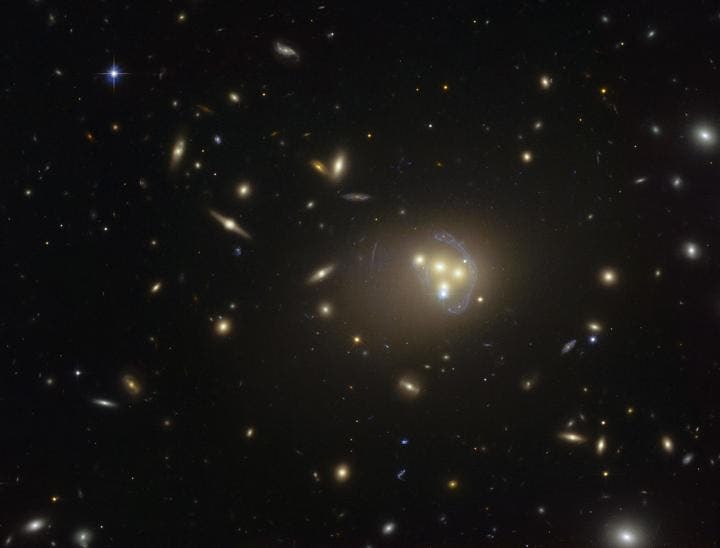 The strange blue structures surrounding the central galaxies are gravitationally lensed views of a much more distant galaxy behind the cluster. Observations of the central four merging galaxies have provided hints that the dark matter around one of the galaxies is not moving with the galaxy itself, possibly implying dark matter-dark matter interactions of an unknown nature are occurring. Our current understanding is that all galaxies exist inside clumps of dark matter. Without the constraining effect of dark matter’s gravity, galaxies like the Milky Way would fling themselves apart as they rotate. In order to prevent this, 85 percent of the Universe’s mass must exist as dark matter, and yet its true nature remains a mystery. Astronomers have found that the total mass/energy content of the Universe is split in the proportions 68% dark energy, 27% dark matter and 5% “normal” matter. So the 85% figure relates to the fraction of “matter” that is dark. This result follows on from a recent result from the team which observed 72 collisions between galaxy clusters and found that dark matter interacts very little with itself. Galaxy clusters contain up to a thousand individual galaxies. The new work however concerns the motion of individual galaxies, rather than clusters of galaxies. Researchers say that the collision between these galaxies could have lasted longer than the collisions observed in the previous study — allowing the effects of even a tiny frictional force to build up over time and create a measurable lag. Taken together, the two results bracket the behaviour of dark matter for the first time. Dark matter interacts more than this, but less than that. Massey added: “We are finally homing in on dark matter from above and below — squeezing our knowledge from two directions. The main uncertainty in the result is the timespan for the collision: the friction that slowed the dark matter could have been a very weak force acting over about a billion years, or a relatively stronger force acting for “only” 100 million years. Pulsars Imploding Into Black Holes –"May Unveil Secrets of Dark Matter"